Russian journalist and publisher; born in Austria 1839; died in Minsk, Russia, 1885. His parents emigrated to Russia, where he received his education at the gymnasium, and he afterward attended the law department of the University of Kiev, from which he was graduated as attorney at law. He practised in St. Petersburg, and wrote articles for the "St. Petersburgskiya Vyedomosti" and for other Russian papers. The excesses against. Jews in South Russia in 1881 made a strong impression upon Rosenfeld, as upon many other educated Russian Jews. From that time he was an ardent nationalist. In the same year he purchased the "Razsvyet," a Jewish periodical in the Russian language, of which he had been coeditor together with G. I. Bogrow. 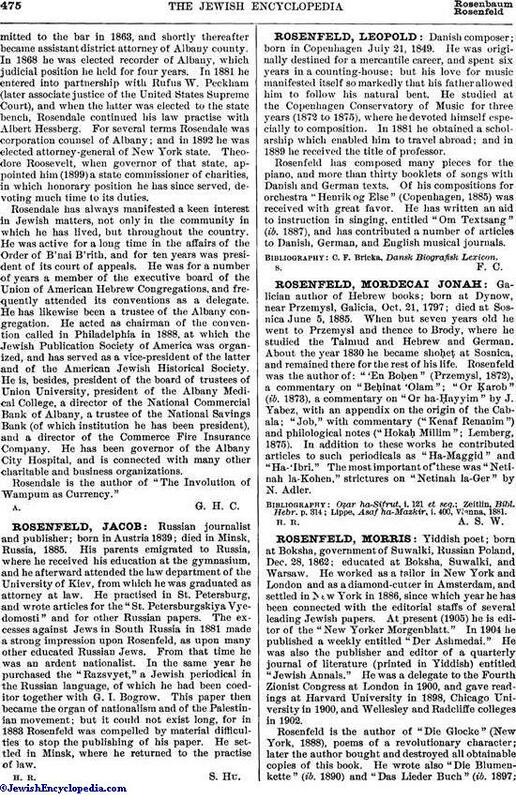 This paper then became the organ of nationalism and of the Palestinian movement; but it could not exist long, for in 1883 Rosenfeld was compelled by material difficulties to stop the publishing of his paper. He settled in Minsk, where he returned to the practise of law.